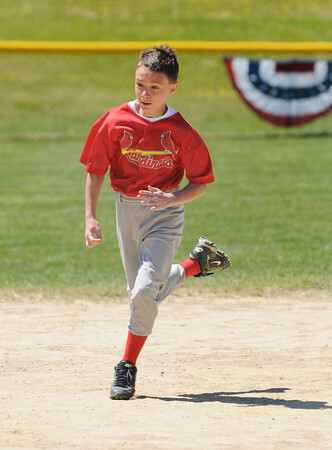 Gloucester: Cardinals Lucas Cornett 11, runs the bases in the Road Runner compatition, Saturday morning at the Little Leauge Home Run Durby at Boudreau Field. The compation is like a relay, with a runner running all the bases and tagging another player standing at home plate. The team with the best time wins. Desi Smith/Gloucester Daily Times.